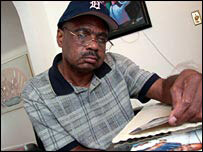 Once Roy Davis had been out of work for a year, his unemployment benefits ran out - and with them, his health insurance. 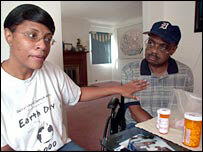 That left him unable to afford his high-blood pressure medication, so he stopped taking it. He finally managed to find another job, but on 8 January 2002 - his second day at work - he had a massive stroke, partly due to the untreated blood pressure problem. He spent three days in a coma, and when he came out of it, he had lost the ability to walk and speak. His wife Defannie now cares for him full-time. She herself does not have health insurance. Her situation has led her to question her country's priorities. "We have the resources to send billions of dollars to Iraq, so I don't think people should have to use [hospital] emergency rooms to get care," she says. Roy Davis's case may be extreme, but it is not unique. In fact, for some, the consequences are even worse: The Institute of Medicine estimates that about 18,000 Americans die each year because they lack health insurance. Almost one in six Americans does not have it - 45 million people, according to US Census Bureau figures released in August. And the percentage of Americans without health care is slowly rising. Defannie Davis is one of many Americans who says health care is among the most important issues in this election. "Security should be top of the list - health care isn't going to matter if we're all dead - but health care should come next. The biggest thing is a person being healthy," she says. She is pleased that Democratic presidential candidate John Kerry has said he would expand health care coverage if elected. Mr Kerry has proposed tax credits for businesses and individuals, health care for all children, and lower costs for prescription drugs. "There is simply no excuse for hard-working Americans having to worry about whether they will be able to afford the treatment they need when they are sick," he has told supporters. President Bush advocates bringing health care costs down by limiting the damages people can claim in medical malpractice lawsuits. "All across the country, doctors are being litigated out of practice and American families are finding it more difficult to find health insurance," Bush campaign spokesman Steve Schmidt told the Associated Press. Mr Bush has also suggested allowing groups of small businesses to band together so they can buy health care plans at the lower rates offered to bigger companies. Unlike many Western nations, the US has no national health care system. "The difference between the US and western Europe is very clear - we never decided that every person should have health coverage," says Stuart Schear of the Robert Wood Johnson Foundation, a charity that focuses on health care. "There has been an effort dating back to the early 20th Century to make sure every American has health coverage, but it has never succeeded." Employers became the primary source of health insurance during World War II. Wages were frozen, so employees negotiated for businesses to provide insurance as an alternative to pay rises. The tax code now encourages employers to purchase health care for their employees. But not all of the uninsured are out of work - the Alliance for Health Reform estimates than more than 80% of uninsured people are employed. The percentage of employers providing health care has dropped from 65% to 61% in the past three years. "Many working people are not offered benefits. Some employers say it is too expensive," Mr Schear says. "Some workers are offered it but have to pay a share [of the costs] when they see a doctor or need medication, so not all who are offered it take it up, because they cannot afford it. "The big policy question is how to help these people."